Walt Disney Animation Studios is now in the stage of their resurgence that began in 2010 with Tangled and was cemented two years later with Wreck-it Ralph where they are hoping to maintain the momentum of this resurgence by beginning to produce sequels to the movies that helped solidify their name as an animation powerhouse once more; that Disney could still be Disney without Pixar. Whereas the former flourished in hand-drawn animation for years and years (obviously) the mouse house hadn't had much luck with their transition to computer animation (Chicken Little, Meet the Robinsons, and Bolt each largely failed both critically and commercially at the time of release) and in trying to re-capture the magic of their nineties hot streak with the hand-drawn Princess and the Frog in 2009 it only seemed the studio was moving backwards instead of forward. With Tangled though, things began to shift and, in many regards, the first Wreck-it Ralph was a confirmation that the Disney brand was back in full effect. Wreck-it Ralph, unlike the more traditional approach Tangled took, was a cool and hip concept that was both relevant and nostalgic, but most importantly it was an idea that-when you were a kid-would have loved to think could really be true. Like Toy Story, Wreck-It-Ralph was about what happens after the kids are done playing and characters must go on with their lives. This was all well and good and spurned a rather fantastic and inventive film about feeling insecure in the role society has assigned you and securing the confidence to break free of that mold and not only become whatever it is you aspire to be, but to gain confidence in and embracing what others might inherently assume about you. Though this wasn't exactly a stretch for the studio given it was ultimately a variation on the "be yourself" lesson countless pieces of children's entertainment have spouted, it worked well given the format. The catch was, Wreck-it Ralph told such a tight and compact story that it was difficult to imagine how directors Rich Moore and Phil Johnston would naturally extend the film into something new that felt organic and wasn't dark as hell considering the inevitability of this arcade eventually closing and all of the games getting unplugged (which they'll have to address in the trilogy-capper, right?). And while the trailers hinted at something scarcely close to The Emoji Movie, Ralph Breaks the Internet is the rare, equally inventive sequel that strives to say something more even if what its saying gets somewhat lost in translation. Even still, the dynamite dynamic between John C. Reilly's Ralph and Sarah Silverman's Vanellope is enough to hold down the fort...or the internet. Vanellope (Sarah Silverman) and her best friend, Ralph (John C. Reilly), are back and onto new adventures. It's been six years since Reilly's Ralph first graced the screen and saved Vanellope von Schweetz and her game, Sugar Rush, from the maniacal Turbo and the two have remained friends ever since and are presently living out Ralph's idea of a perfect existence. Vanellope isn't doing too bad either, but shortly into our re-introduction of the characters it becomes quite obvious Vanellope is also getting restless in the limited number of courses Sugar Rush offers and the lack of new, exciting options life is offering her. In short, she's fallen victim to routine while Ralph, her best friend, is relishing in it. It is when Ralph tries to assist his friend by carving out a new track in the candy land that makes up Sugar Rush though, that Ralph does more harm than good. Vanellope, her heart set on trying the new course veers in the opposite direction of the real-life player in the arcade forcing the steering wheel on the arcade game to break. Mr. Litwak, the owner/curator of the arcade, is overheard telling the young girls who broke the wheel that the price of a new part is more than Sugar Rush makes over an entire year and that he'll unfortunately have to unplug the game. By unplugging Sugar Rush, Vanellope and every character in the game are essentially rendered homeless leaving the rest of the games and their characters to find homes for them. While Ralph tries to be optimistic about the turn of events by framing it to Vanellope in such a way it sounds like she no longer has a job and therefore no real responsibility, Vanellope can't help but to acknowledge the reality of the situation as her glitch begins to worsen without a game to belong to in which her code is written into. Vanellope is no longer the fun-loving, adventurous princess Ralph knows and loves despite the fact he now has more time than ever to spend with her. After a conversation with Fix-It Felix Jr. (Jack McBrayer) at Tapper's, where Ralph typically has an after-work root beer with Vanellope, he is reminded of the newly installed Wi-Fi router that he can use to access the internet and more specifically, a site called eBay, where he knows there's a new wheel for Sugar Rush available to purchase thanks to one of the aforementioned kids in the arcade. Ralph hurriedly relays his plan to Vanellope who is completely on board and the two make their way to the wi-fi port via the surge protector and follow Litwak's avatar into this new world. It is here that Ralph Breaks the Internet really digs into its premise of taking these analog characters into a completely digital world and the opportunities that might be unlocked because of it; something that might be of great potential danger to a friendship where one party is living the dream with things as they are and the other is craving change. Within the internet Disney has essentially allowed themselves to run rampant with the countless IPs and brands they own, but while this very well could have felt gimmicky (see The Emoji Movie) it never comes off as such and instead is quite astute about the internet in and of itself. This is more in a sense of our present culture that feels all-consumed by online personas and the need for validation from anonymous clicks and likes by people one may not even know. It is in this sense that Ralph comes to judge his own merit and worth based on the feedback he sees in a comments section which, if you know anything about the rules of the internet and more specifically-about putting any part of yourself on the internet-then rule number one is to never read the comments. It is in the comments section of life (excuse the corniness) that people tend to lose themselves to who they think they should be rather than who they truly are and while one might not expect a Disney sequel to reassure them of their own perceived shortcomings that are likely glazed over in online profiles are more like fingerprints in that each of us have our own and that they're ultimately what make each of us individuals, well...leave it to Wreck-it Ralph 2 to call that bluff. 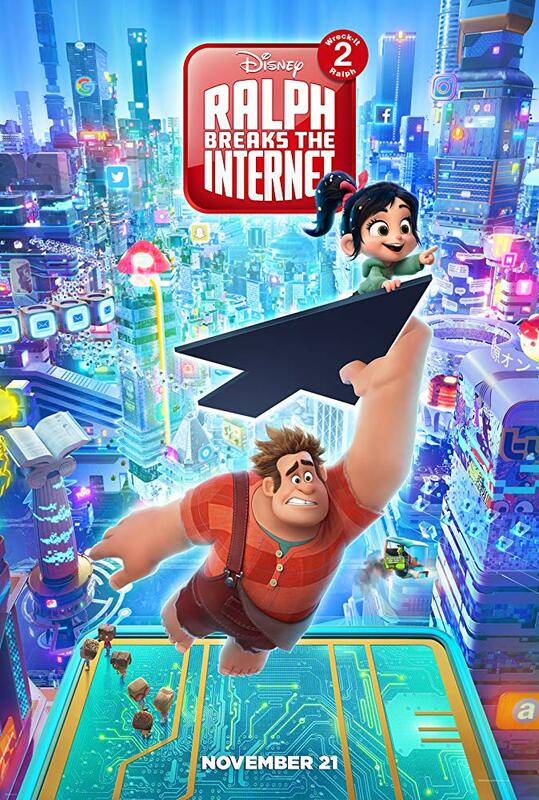 Ralph Breaks the Internet isn't going to only be about the darker aspects that lurk within the internet of course, but Moore and Johnston along with their screenwriting team were clearly intent on delving deeper into this huge aspect of our present culture outside of simply resorting to a, "Hey! We bet you recognize this from the internet!" mentality. This works to the bigger theme of the film that deal in self-destruction and the destruction of key relationships by painting a picture of Ralph that becomes consumed by this need to maintain his friendship with Vanellope because with her he at least knows none of these things he's read on the internet are true. It's quite a powerful and surprisingly dark (my just turned four-year-old daughter was scared by the visual representation of this feeling) moment in the film. Ralph completely loses his perspective as he's allowed these things other people have said about him to manifest in his personality resulting in a Ralph we nor he recognizes. That's the heavy stuff that you can dig into if you're an adult bored with the idea of characters chasing a steering wheel around a fictional embodiment of the internet, but don't think for a second Moore and Johnston and Disney weren't going to also capitalize on everything the studio encompasses that is available through them online. Once again though, this isn't done in a gimmicky fashion as the much talked about Disney Princesses scene is both appropriately self-aware and celebratory around who each of the individual characters are. And if Disney isn't printing the tank tops each of the princesses were wearing in said scene to sell in every park and store across the country I take back everything I said about them being intelligent because that would be dumb. Yesss (Taraji P. Henson) is an algorithm that determines the trending videos on BuzzzTube in Ralph Breaks the Internet. On the other side of the whole internet premise, the world it creates, and the timely themes it touches upon Ralph Breaks the Internet is also a layered metaphor that could resonate with multiple kinds of relationships whether it be parent to child, significant other to significant other, or-as is most obvious given the film's example-that of a friendship. As hinted in the previous paragraph, Ralph becomes consumed in retaining his relationship with Vanellope despite her inclinations to move forward with her life; to move on to something new outside of their arcade. The film more explicitly deals in the nature of how different individuals deal with change within these relationships while reinforcing the ideas that there is validity in your own goals even if they may not match what authority figures or those who love you want for you. This is an admittedly dangerous line for the film to walk as there are no doubt cases in which this will be taken the wrong way, but as much as it seems the movie might suggest doing what you want no matter the objections, it is sure to emphasize the specific line of thought that is doing what you know is right for you rather than simply doing something because it goes against what superiors want for you; more a "follow your own path" ideal than anything, but within the circumstances of a relationship that undoubtedly mirror what large portions of the audience have experienced-whether it be groups of tween friends who are hearing this sermon for the first time or new parents (such as myself) who need gentle reminders that we can't hover over and control every aspect of our children's lives. Furthermore, Ralph Breaks the Internet doesn't just use this new world of the internet to drive the plot forward, but rather-especially as the film enters the crux of the second act and on through to the third-the film becomes more about the roles the characters are playing in each other's lives than it does the roles they are playing in the movie. While the steering wheel is what both Ralph and Vanellope are after, it is not what either of them actually gain. Rather, Ralph is struck by these tendencies he didn't even realize he was exuding and while his actions may come off as negative what is more magical and slyly intelligent about the film than any self-aware reference is how well the sequel actually builds off the development of Ralph in the first film. In Wreck-it Ralph, Ralph was a guy who'd been labeled as one thing his entire life and was tired of the stereotype. In going through the journey Ralph did in the first film he was able to find comfort not only in who he was, but in these new relationships that confirmed-for him-that he was more than just a villain, that he wasn't a "bad guy". And so, it's understandable that Ralph would fear losing something that he's just recently obtained or that he would (literally) become self-destructive in an effort to maintain this new normal. That Ralph Breaks the Internet culminates with our titular hero not so much acting like a hero, but learning that his needy, greedy, and self-destructive tendencies are pushing his friend further away rather than keeping her close is bold. To go a step further and illustrate that Ralph has to fix his own insecurities in order to allow Vanellope to follow her path and ultimately feel best about who he is not because he got what he wanted, but because he did the right thing in allowing his friend to be happy makes this equally inventive sequel that strives to say more than, "Hey! Look! It's the internet!" that much more meaningful.